If you want to more effectively attract your target audience and encourage them to do business with you, thought leadership is key. If you have the foresight and vision to offer your audience something fresh and original, they will appreciate the fact they are getting the information they are not getting anywhere else and they will be more likely to do business with you. Thought leadership can be utilized to achieve this and can be used as a marketing strategy to build your brand, whether you are a startup, and SME or a firmly establish enterprise. The insight you share with your audience has the value that will translate into equity, meaning your audience will apply the value of your content and information to your services and products. Although blogging is a perfectly effective way to show your audience thought leadership in a particular area of business or niche, it is just one way of doing this. Another effective thought leadership strategy is publishing articles in various publications, which helps to spread your thought leadership so that it reaches an even larger audience than relying solely on the blog you use at the moment. Content is always key in marketing, particularly online, so it is wise to spend a reasonable amount of time developing content that has real value that will speak to your audience. Our journalists have the experience and network to understand trending topics and to create editorial to support thought leadership strategy. Often publications will want exclusive content, which means we write new and dynamic article per targeted publication. 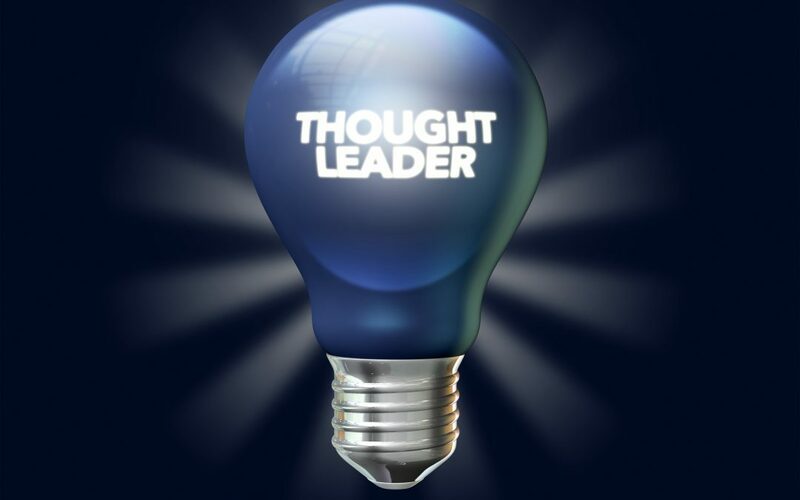 Once thought leadership is published, it is then time to action across social media channels. While in the past, white papers were reserved for more technical industries such as software companies and the like, it has started to become an effective and integral part of illustrating thought leadership in specific business areas. When you use statistics, research and content in combination, you can show your audience that you have done the relevant homework. It can be used to generate fresh insight into existing problems that are impacting your potential customers/clients in some way by creating surveys. It is highly recommended that you conduct thorough research on the issues affecting your audience most and produce findings and research that prove you understand the problems they are facing. By doing this you are not only showing your audience that you have the knowledge, but also the leadership to provide them with solutions without even selling anything directly. Case Studies are the perfect tool for thought leadership as they can be used to prove the effectiveness of your services and products to your wider audience by providing examples of where you have successfully helped customers. Customer testimonials and reviews provided additional voices to your own that speak volumes about your company’s ability. When an individual reads a particular case study and can relate to the situation highlighted, it will impress upon them the value of your company’s products and/or services. This is even a stronger case when bringing new technologies to market, where the industry is saturated or consumer education is key to driving traction. As new technologies come to market, as consumers, we easily dismiss products we do not fully understand. With the power of thought leadership, we are educated and feel secure enough to take steps to on boarding the next big digital revolution. Make it easier for content to be consumed in media, marketing and sales channels.